Postmodernism and poststructuralism are both relativist in orientation, and face the same problem as philosophical sceptics in general: how to justify value judgements. 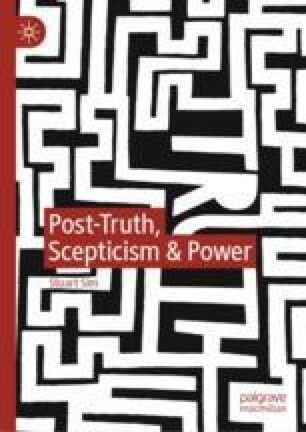 This comes through strongly in the work of Jean-François Lyotard and Jacques Derrida, whose work is compared here to see how each deals with the issue, and what this might reveal about the claims of post-truthers. Postmodernist-poststructuralist thought is often accused of an extreme relativism, and this might be taken to imply that post-truth is difficult to critique if there is no absolute concept of truth to fall back on. Derrida’s deconstruction seems to preclude making value judgements, whereas Lyotard’s overtly political outlook demands that he confront this problem to find pragmatic ways around it. He argues that it is possible to have a ‘relative certainty’ as regards truth, and that one should therefore continue to make value judgements – particularly in matters concerning ethics.